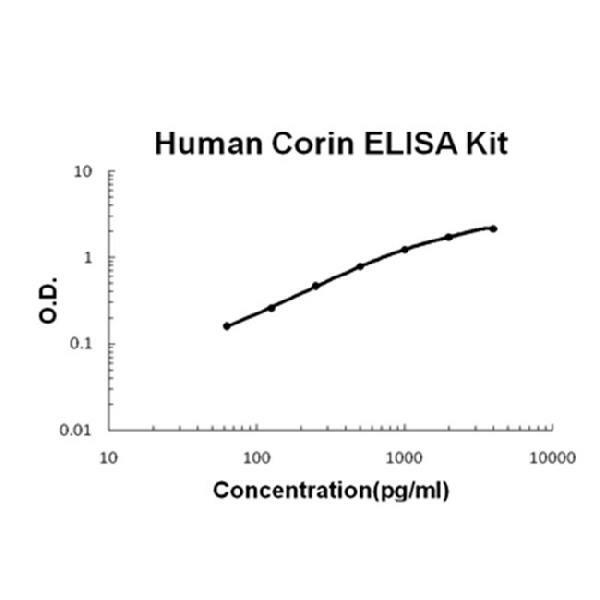 Sandwich High Sensitivity ELISA kit for Quantitative Detection of Human Corin. 96wells/kit, with removable strips. Highly expressed in heart. Expressed in heart myocytes. Also expressed in pregnant uterus. Detected in blood, in plasma as well as in serum (at protein level). . Cell membrane ; Single- pass type II membrane protein . May easily detached from the endothelial cell membrane. Atrial natriuretic peptide-converting enzyme, also called CRN or ATC2, is a protein that in humans is encoded by the CORIN gene. It is mapped to 4p12. This gene encodes a member of the type II transmembrane serine protease class of the trypsin superfamily. Members of this family are composed of multiple structurally distinct domains. It has been found that Corin is the pro-ANP-converting enzyme and that Corin-mediated pro-ANP activation may play a role in regulating blood pressure. What’s more, Corin and ANP are essential for physiologic changes at the maternal-fetal interface. This protein may also function as a pro-brain-type natriuretic peptide convertase. Corin gene mutations which cause Corin to impair activity might be an underlying mechanism in hypertension.